Pay attention to your Android Vitals. If your app is crashing it will be hard to rank any keywords on Google play. Hopefully Andromo updates soon because this is major problem with now. Yeah, I've noticed my latest app builds have been crashing a lot more than in the past. This is my app that has the most users. You can see it's really deteriorated just recently after being rock stable. Everyone may want to hold off on any new builds until we see if the new owners can get their act together. Yes my apps are doing the same thing and it also started on February 1. I am also waiting on them to update the system. All andromo apps are crashing like this and being deranked by google. WAAW so thats the cause why my app is no longer featured. i lost 3/4 of my revenue. This half month 15 march already 77.289 crashes... I regret updating my app. And my subscription is ending in April. I don't know should I continue it or not. I got an email from andromo this morning saying the fixed the issue and to update your apps. Update your apps to see if the issue is fixed. Any idea how many apps and builds of what date and after were affected? thanks lawrence72117 ! 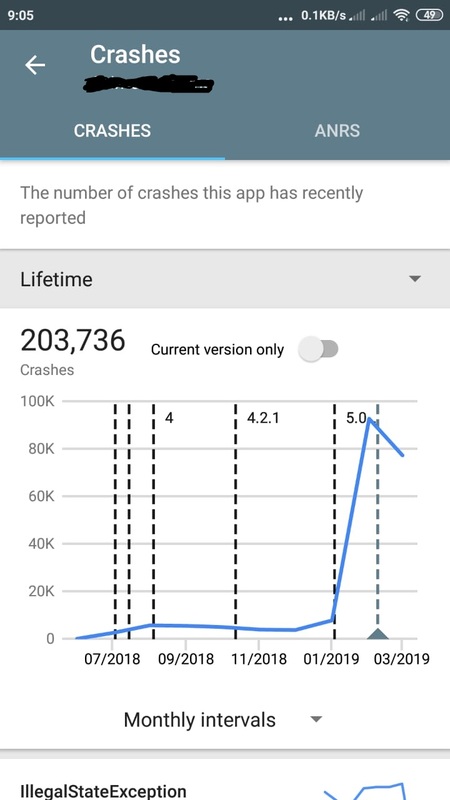 I updated my app and the crash is decreasing. Hi everyone, we apologize for the unfortunate increase in ANRs. We are looking into why this happened. It's highly unusual. We have fixed that crashes. Try to rebuild your apps. If you have any problems feel free to write to our support.